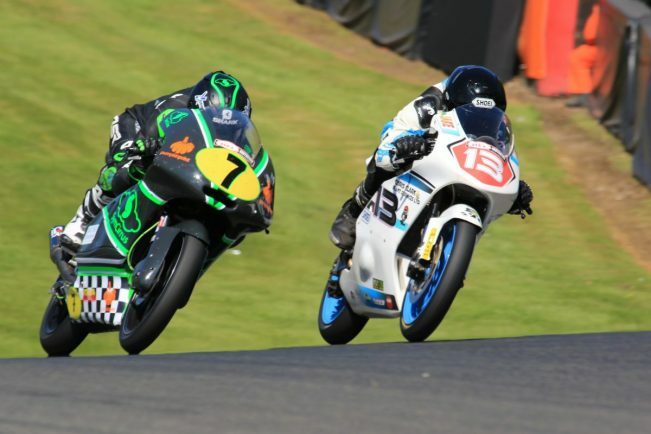 BROMSGROVE racer Jake Clark finished the Bank Holiday weekend with two ninth place finishes at Oulton Park in the second round of the Hel Performance British Motostar Standard Class Championship. The 15-year-old raced under bright blue skies for Saturday’s first free practice session where he finished tenth overall before slipping to 15th by the end of the day with a lap time of 1:50.581. The glorious weather continued into Sunday as 49 bikes took to the circuit for qualifying. Clark was quickly out the pits and managed to complete 12 laps with a best time of 1:50.898 which put him ninth in his class. The first race followed in the afternoon and from the off Clark was sandwiched into the first corner and was forced to back off. This allowed the front pack to open up a gap and left Clark in a fierce battle for ninth with positions changing throughout. At one point Clark ran wide and dropped down to 12th but battled back to cross the line in ninth. For the second race on Monday, Clark started in ninth in his class after grid positions were based on the fastest laps from race one. The Wilson Racing rider made an excellent start, moving up to sixth on the first lap. As the race went on he came under increasing pressure in an a really competitive race. He eventually ended the 14-lap race in ninth. “I qualified ninth so in race one I was hoping to get away with the front-runners,” said Clark. “But I had to back off in the first corner to avoid an accident and then the leaders were gone. “We had some real close racing and I got pushed wide and had to make up the ground again. “In the end I was quite happy with ninth. “In the second race I made a great start and I was feeling really positive. “However, as the race went on I slipped back a bit with some riders a bit more experienced than me on the braking. The next Moto3 race for Clark will be from July 6-8 at the Knockhill circuit in Scotland.